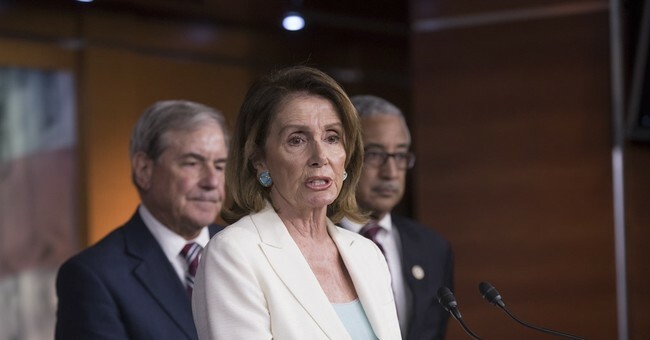 House Minority Leader Nancy Pelosi finally took a break from attacking Trump supporters Tuesday to condemn Antifa. The violence in Berkeley over the weekend, which led to six injuries and 13 arrests, forced the California Democrat to issue a statement. Initially she made no comment after the violence, only relaying to news outlets through a spokesman that she “has always emphasized the importance of ‘peaceful’ in the right to peaceful protest.” Antifa was not mentioned, however, and her latest statement condemning their violence appears to be the first time she’s even publicly acknowledged their existence. Other California Democrats are finally speaking out about antifa as well. Berkeley Mayor Jesse Arreguin told reporters after Saturday's Berkeley No to Marxism in America event that he believed it was time to "classify [antifa] as a gang." “They come dressed in uniforms. They have weapons, almost like a militia, and I think we need to think about that in terms of our law enforcement approach,” Arreguin, a Democrat, told CBS5 in San Francisco.